Düsseldorf (renewablepress) - At Energy Storage Europe, exhibitors will for the first time present market-ready flywheel, redox flow and Power-2-X storage solutions under one roof. A further focus is on swarm storage concepts, which combine numerous decentralised storage units with each other and thus assume the functions of large storage facilities. The trade fair and conference will take place at the exhibition grounds in Düsseldorf from 13 to 15 March. 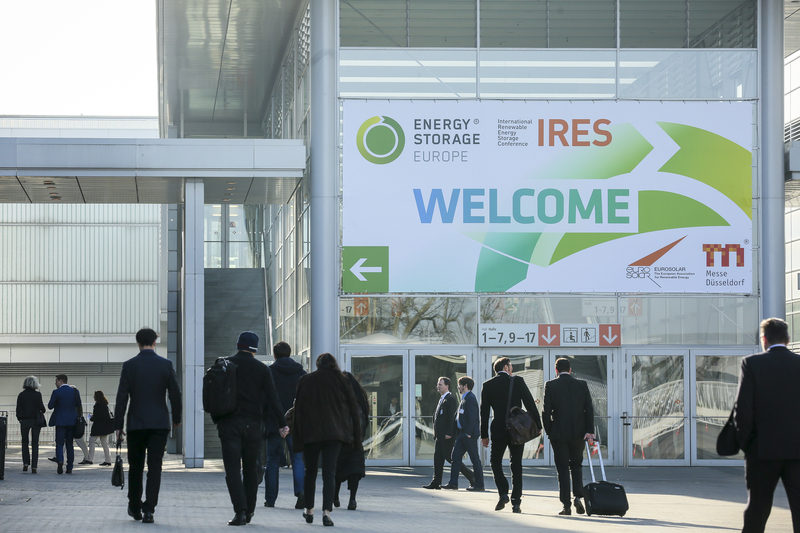 Innovative storage technologies leave the experimental and prototype stages behind and are becoming part of the practical energy turnaround, which is proven by the exhibitor registrations for Energy Storage Europe 2018. The products on show are of interest, for example, to industrial companies and energy suppliers, who have to store larger amounts of energy or who require a particularly large number of charging and discharging cycles. An example would be the flywheel storage systems of exhibitor Storenetic, whose magnetic field-bearing glass-fibre rotor rotates at speeds of up to 45,000 revolutions per minute in a vacuum and thus stores rotational energy. Extremely short charging and discharging times starting at 260 seconds allow very short and frequent cycles. In addition to the new technologies, exhibitors in Düsseldorf will present battery storage solutions of all sizes. Furthermore, swarm storage concepts will also be discussed at the trade fair and conference. These concepts network numerous decentralized storage facilities and bring different business models particularly well in line with each other. "For one thing, swarm storage systems can stabilize networks. In addition, their operators benefit very individually. In this way, local storage systems can increase solar power consumption or cut peak loads in commercial operations. This combination of different sources of income ensures higher yields and better risk diversification for operators," says swarm storage expert Markus Brehler. The cost advantages of swarm storage systems also result from the housing and installation requirements: Classic large storage systems collect a lot of capacity in one location and require special cooling and fire protection measures; from a certain size upwards, even own buildings may become necessary. In addition, particularly powerful large storage facilities often require their own power supply. Such costly requirements can be mitigated by using swarm concepts. Within the scope of the conference lecture "Energy Storage in Future Buildings, Industrial Processes and Power Plants", these and other topics concerning swarm and large storage facilities will be discussed.